Propeller shaft, tail shaft – The aftermost section of the propulsion shafting in the stern tube in single screw ships and in the struts of multiple screw ships to which the propeller is fitted. Propulsion shafting constitutes a system of revolving rods that transmit power and motion from the main drive to the propeller. The shafting is supported by an appropriate number of bearings. Shaft bearings : The intermediate shafting (Figure 8.2) between the tailshaft and main engine, gearbox or thrustblock may be supported in plain, tilting pad or roller bearings. The two former types usually have individual oil sumps, the oil being circulated by a collar and scraper device; roller bearings are grease lubricated. The individual oil sumps usually have cooling water coils or a simple cooling water chamber fitted. Cooling water is provided from a service main connected to the sea-water circulating system. The cooling water passes directly overboard. Usually for plain and tilting pad bearings, only a bottom bearing half is provided, the top acting purely as a cover. The aftermost plumber block however, always has a full bearing. 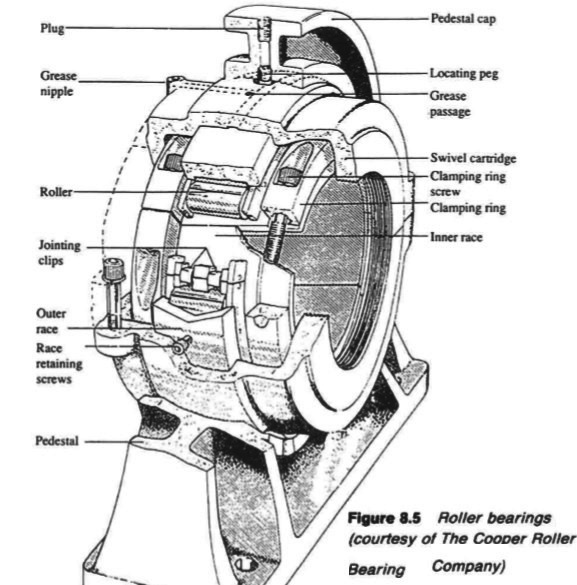 This bearing and any bearing in the forward end of the stern tube, may be subject to negative loading. Any oil between a static shaft and plain journal bearing in which it rests, tends to be squeezed out so that there is metal to metal contact. At the start of the rotation the journal is inclined to roll up the bearing surface against the direction of rotation until friction slip occurs. Then, provided there is oil in the clearance space, this will cling to the moving surface and be dragged between the shaft and the bearing. 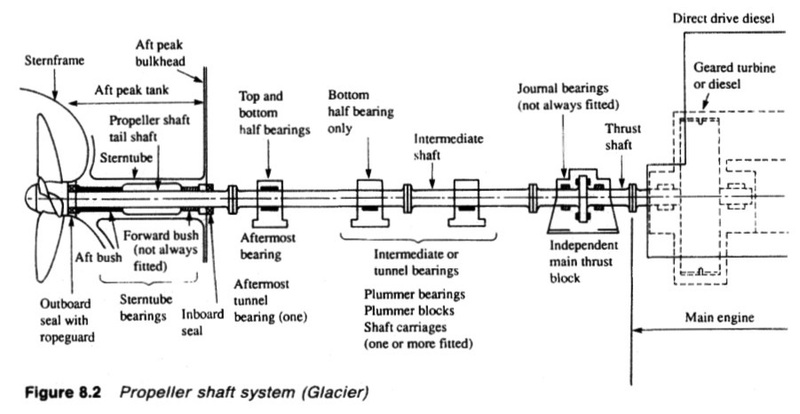 Shaft rotation, as it speeds up, continues to carry oil to the shaft underside so developing a film with sufficient pressure to hold the shaft clear of the bearing. The pressure build-up is related to speed of rotation, Thus oil delivered as the shaft turns at normal speed, will form a layer or film, separating shaft and bearing, and so prevent direct wear of metal to metal. Pressure generated in the oil film, is most effective over about one third of the bearing area (Figure 8.3) because of oil loss at the bearing ends and peripherally. Load is supported and transmitted to the journal, mainly by the area where the film is generated. Replacement of the ineffective side portions of the journal by pads capable of carrying load will considerably increase its capacity. 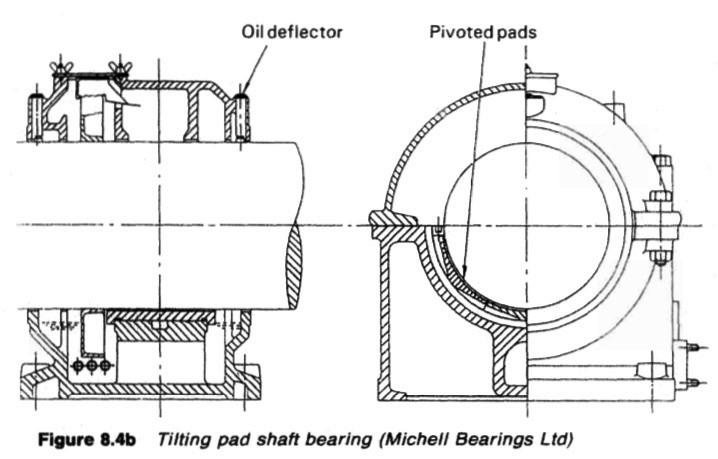 Tilting pads based on those developed by Michell for thrust blocks (Figure 8.4a) are used for the purpose. Each pad tilts as oil is delivered to it, so that a wedge of oil is formed. The three pressure wedges give a larger total support area than that obtained with a plain bearing. The arrangement of pads in a bearing is shown in Figure 8.4b. The tilt of the pads automatically adjusts to suit load, speed and oil viscosity. The wedge of oil gives a greater separation between shaft and bearing than does the oil film in a plain journal. 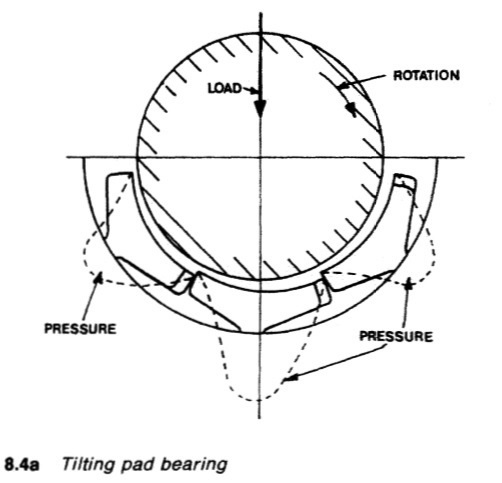 The enhanced load capacity of a tilting pad design, permits the use of shorter length bearings or fewer bearings. Roller bearings (Figure 8.5) are supplied in sizes to suit shafts up to the largest diameter. Flange couplings dictate that roller bearing races must be in two parts for fitting. The section of the shaft where the split roller bearing is to be fitted, must be machined very accurately and with good finish. The two halves of the inner and outer races are fitted and held with clamping rings. 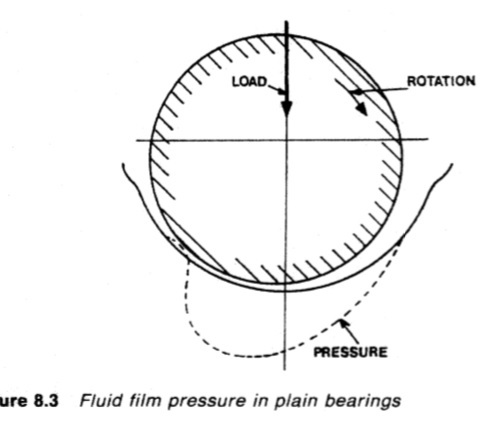 Adequate speed for build-up of fluid film pressure is vital for journal bearings. At low speeds there may be metal to metal contact with wear and damage. Friction at low rotational speeds, is high. Roller bearings are not dependent on speed for effective lubrication. Friction is low at all speeds. This makes them suitable for steam turbine installations and in ships where slow steaming may be necessary. Roller bearings, where fitted, are grease-lubricated.